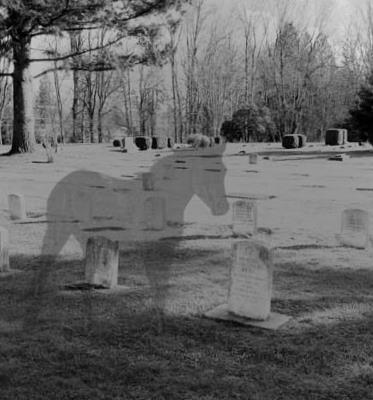 "The White Ghost Horse" ... A Manitoba Ghost Story from the Cree Tribe. A Cree Indian Chief had a very beautiful daughter who was sought after by many brave warriors. There were two suitors who led the rivalry for her hand, a Cree Chief from Lake Winnipegosis and a Sioux Chief from Devil's Lake. The girl herself favored the Cree warrior, and when he brought a beautiful white horse from Mexico as a gift for her father, the man agreed to the marriage. The Sioux chief was enraged by the rejection of his suit. On the day of the wedding, he gathered a war-party and came thundering across the plains toward the home of the beautiful maiden. The Cree chief tossed his lovely bride on top of the white horse and le upon his own gray steed. The couple fled to the west with the rejected Sioux and his war-party on their heels. The Cree Chief doubled back several times and the couple hid among the prairie bluffs. For a time, it seemed as if they had lost the Sioux. But once they were on the plains again, the beautiful white horse was visible for miles, and the war party soon found them. A rain of arrows fell upon the fleeing lovers, and the warrior and his bride fell dead from their mounts. At once, the Sioux captured the gray steed, but the white horse evaded them. One man claimed he saw the spirit of the young bride enter into the horse just before it fled from their clutches. The white horse roamed the prairies for many years following the death of the Cree warrior and his lovely bride. The inhabitants feared to approach the horse, since the spirit of the maiden dwelled within it. Long after its physical body passed away, the soul of the white ghost horse continued to gallop across the plains, and the land where it roamed became known as the White Horse Plain. They say that the spirit of the white ghost horse continues to haunt the prairie and the grave of the young bride to this very day.